Great teams are the heart and soul of any organization, especially teams that learn and grow together. One game-changing opportunity for 2018 to nurture teams and better work relationships is the willingness to give timely and effective feedback to your colleagues. We probably all give subtle hints and even downright direct comments when needed. However, giving meaningful feedback is a skill that can be learned and developed by you and your team. How often is best? This feedback should be ongoing, not just once or twice a year, as it’s important to deliver feedback throughout the year (not just during an annual review) to stimulate productivity and eliminate surprises. After all, who wants to go to a meeting that both employee and supervisors are dreading! Whether in a formal, scheduled “review-like” setting, or in a spontaneous conversation, feedback contributes to improvement, productive changes, effectiveness, clear direction and, ultimately, success. Candid feedback can be critical and difficult, but it also sets a positive tone for both personal and professional growth — pivotal for ongoing improvement. I recently worked with a retail organization that was trying to create a trustworthy culture for ongoing feedback. The company did this by requesting that each manager schedule a coffee break twice per month with every member of their team. The first few sessions were a bit awkward, as the managers and employees were still learning the skills and process for creating a safe, trusting relationship. One particular manager, Anne, wasn’t very confident in her ability. When she expressed her doubts about a positive outcome from this experiment, we developed a checklist for her to follow. As the schedule became more routine, Anne gained competence and both parties looked forward to the meeting and the results — increased understanding and a deeper work relationship. How did Anne and her employee achieve this outcome? She used the following five steps, and even shared them with her team so that they had an understanding of the process. Create and nurture your feedback zone. This requires a specific state of mind, attitude, understanding and outlook that prepares you to develop and deliver the most effective feedback possible. Think before you give feedback. Think specifically, engaging your empathy and intuition, as well as your managerial skills and business/employee goals, preparing and rehearsing (in your mind) the feedback you’ll be giving. Learn the language of effective feedback. The language and words you’ll use, as well as the tone, will determine the effectiveness of your feedback message. Ask permission before giving feedback. Effective feedback is a conversation and a dialog, not a lecture. By asking permission, you’re showing respect and an implied invitation for the employee to participate in the feedback conversation. Feedback involves both follow-up and follow-through. Unlike annual performance reviews and other static employee communications and interactions, a genuine feedback process doesn’t stop as soon as the initial feedback conversation is ended. Effective and worthwhile feedback is virtually always a starting point. The result of this effective feedback? Anne became a proud and successful manager by simply learning a process and sharing it with her employees. She moved closer and closer to her goals until she had the highest-producing team of the year. There were other factors, of course, but she credits her dedication to a consistent, scheduled conversation with each team member with their collective success. Feedback is about support and improvement, and a high-energy, positive work environment sets a dynamic tone and culture for employees and retail customers alike. 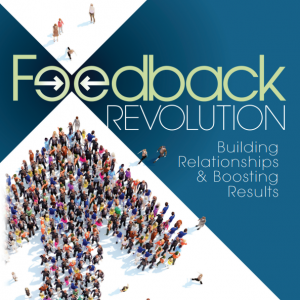 Marjorie (Margie) M. Mauldin is the author of “Feedback Revolution,” as well as founder and president of Executive Forum.